Be aware! 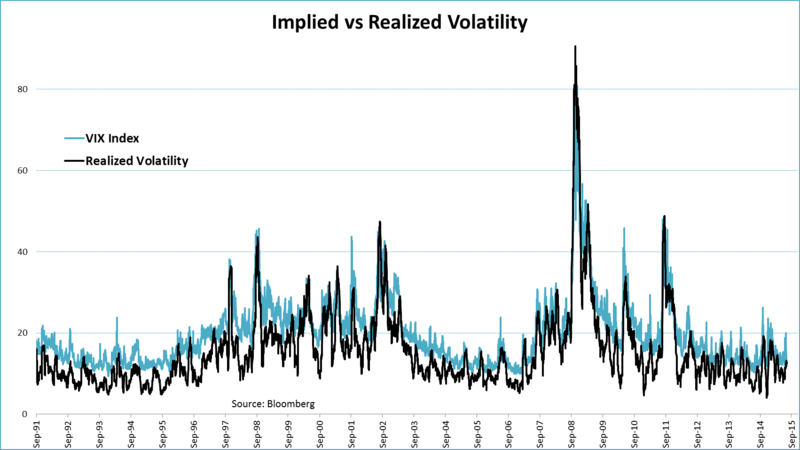 Betting on rising volatility requires an impeccable timing skill! Equity market volatility is low. Hence, recommendations to invest in volatility are abundant again. But before you pursue such an investment, let me warn you first. Because, making a profit from such an investment strategy requires perfect foresight. On average, a long position in volatility is a very unprofitable strategy. Especially, when volatility is low! Now, from a theoretical point of view, investing in volatility certainly makes sense. Please take a look at the graph below. It shows that the correlation between changes in the S&P 500 Index and the VIX index is outright negative. 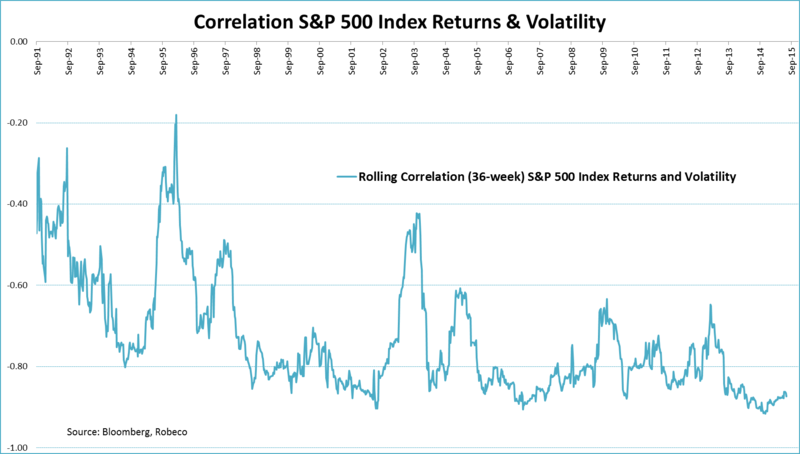 When volatility spikes, stocks go down and vice versa. No surprise there. Basically, if you are long equities you are short volatility. Therefore, adding some volatility to your portfolio should come with the benefit of diversification. However, putting this theory into practice has undesirable side effects. Since investors, who hold equities, acknowledge that they are short risk, they are willing to pay a premium to hedge that short position in volatility. It’s exactly for this reason that the realized volatility is on average lower than the implied volatility (represented here by the VIX index.) The graph below shows this ‘volatility risk premium’ over time. 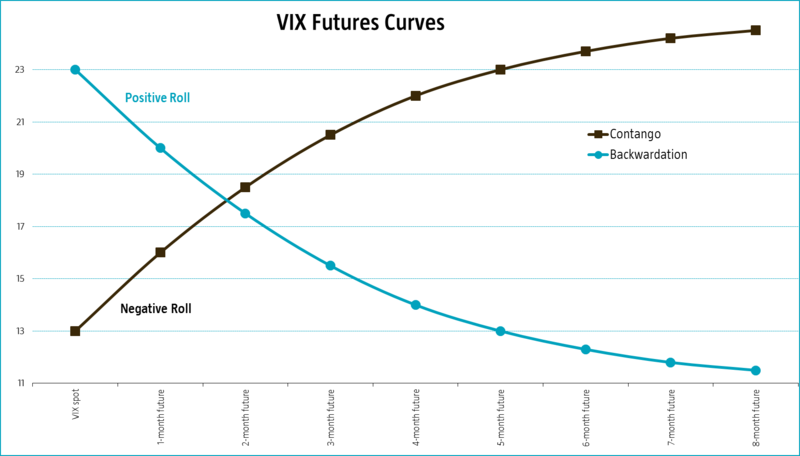 The ‘contango curve’ above indicates you can buy a 1-month volatility future at a price of 16, while the current VIX spot index is at 13. This implies a negative roll return of 19% (13/16-1). Theoretically, this negative roll return will be completely offset as the VIX spot price increases to 16 over that 1-month period. But, in practice this won’t happen. On average, the VIX index won’t get to 16, but stay below that number, let’s say at 14. The difference between the two is the volatility risk premium. You simply have to pay up to hedge your volatility risk. The seller of the VIX future is the one that collects this premium. To make things worse: the volatility premium tends to be bigger when volatility is low! So, just when you think it’s a wise idea to invest in volatility, because the VIX index is ‘attractively low’, you get hit hardest by the volatility risk premium. The volatility risk premium demands that your timing skill is impeccable when you go long the VIX index. For each month in which the VIX doesn’t go up, you lose the volatility risk premium. And that loss can very significant. A 5-10% premium (read loss), per month(! ), on your investment is no exception. If you find that hard to believe, just take a good look at the graph below. 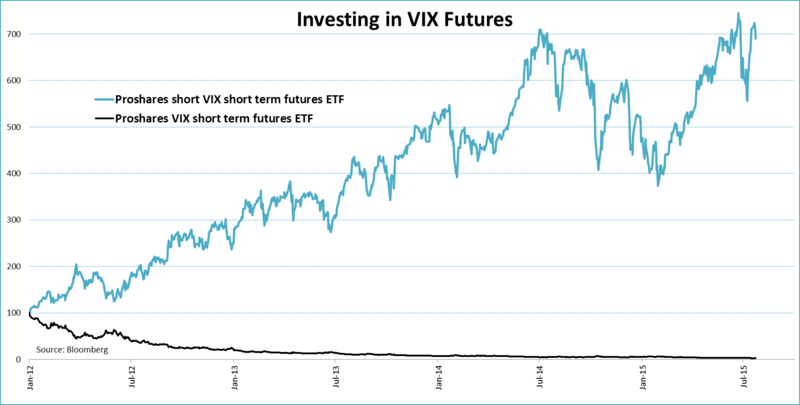 It shows the returns of two ETFs: one going long VIX futures and the other going short VIX futures. Since 2012, an investment in the ETF that goes long volatility would have been completely wiped out, while an investment in the short volatility ETF would have yielded a return of 600%. The difference: paying or receiving the volatility risk premium. I sincerely hope you have a crystal ball! ← Week End Blog – Commodity Collapse!